Democrats have racked up an impressive record in special legislative elections across the country this year. They’ve flipped six seats, while Republicans haven’t picked up any. Most Democratic candidates have vastly improved on Hillary Clinton’s 2016 showing, as well. So in spite of the fact that the party has lost some high-profile special congressional elections in Georgia and Montana, many political handicappers believe the Dems are well-positioned for a good year in 2018. And yet, an obscure race in Michigan’s Upper Peninsula next month has the power to change that narrative. Democrats are palpably nervous about a special House election they should easily win. The 109th has a solid 56.9 percent Democratic base, per Inside Michigan Politics, and has been held by a string of Democrats, most recently by the late Rep. John Kivela (D-Marquette), whose suicide devastated members on both sides of the aisle. The Democratic nominee is Sara Cambensy, a former Marquette city commissioner who eked out a win in the Aug. 8 special primary. Her history of primarying Kivela in ‘16 has not been particularly helpful with the base. U.P. unions have been out knocking doors and the Michigan Democratic Party has ramped up fundraising for her. Republicans believe this one could be a sleeper, as I’ve noted. The U.P. has definitely been getting redder. Last year, President Trump triumphed in three of the four counties in the 109th, although he lost Marquette County, the district’s population base. The GOP state House nominee, Marquette school board President Rich Rossway, is ensconced in the community and notably isn’t stressing his party label (much like Dems in red areas have done for years). In fact, Rossway joined striking UP Health System-Marquette nurses on the picket line this month (along with Cambensy) — something that’s become rarer for Republicans as the party has adopted a stronger anti-union bent. This is one of the two special state House elections on Nov. 7 (the Dems are fully confident of holding the 1st District that includes Detroit and Wayne County suburbs). There’s a lot on the line. Losing the 109th would result in a 64-46 GOP majority. That’s a feat Republicans only briefly achieved in 2012 when then-Democratic Rep. Roy Schmidt switched parties right before the filing deadline (he went on to lose his seat). The Ds would then have to flip 10 seats next year to regain the majority, which would probably give donors pause and cause the state House to tumble down the priority list. Taking an “L” in the 109th could depress fundraising for Democrats across the board in Michigan, from the governor’s race on down. And it would certainly result in a devastating storyline that Democrats truly are in a freefall in the state. After all, Democrats haven’t held the governor’s mansion, state House, Michigan Supreme Court or a majority in the congressional delegation since 2010. They haven’t controlled the state Senate since 1984. In 2016, the Ds were fully expected to pick up state House seats during a presidential year and Clinton was supposed to handily win Michigan. Neither of those things happened. And so, if the Dems can’t even hold what’s supposed to be a safe state House seat at a time when the party is ascendent nationally, the storyline will be that Michigan is clearly now a red state. A loss like this has the power to change the national narrative, as well. Expect election forecasters to declare that a Democratic wave in 2018 is now in doubt. Some will predict that Dems will have to settle for a more moderate year — which means dreams of winning back either chamber of Congress is kaput. A more pessimistic read is that states that have been growing more conservative, like Michigan, Wisconsin and Ohio, will continue that trend next year. So how competitive is the 109th? Is this all just standard Democratic angst? That’s not clear. No one’s confident about what the electorate will look like in this special election and there’s been no public polling. And hey, I talked to plenty of Dem leaders in 2008 who were convinced Barack Obama was going to blow the election right up until the very end. He ended up beating John McCain nationally by 7 points and conquering Michigan by an astounding 16 point-margin. We went through the same dance in 2012, with a prominent Dem official texting me during the first Obama-Mitt Romney debate that all was lost for sure. 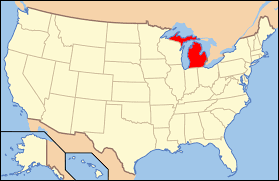 The incumbent president went on to win re-election by a 4-point margin nationally and took Romney’s native Michigan by almost 10 points. In 2016, many of the same Dem “Chicken Littles” told us the sky was falling again. Of course, this time, they were right. Trump pulled out a roughly 10,000-vote win over Clinton, helping push him over the top in the Electoral College. It’s possible that the Ds are being paranoid about the 109th and they’ll pull off a win on Nov. 7. It might not even be particularly close. But given how ‘16 turned out, most Dems are OK with hitting the panic button on this one, especially if it motivates fundraising and the base to turn out. After all, everyone knows there’s far more on the line than just that particular House seat on the ballot.